Tensions are high and we might see some missile strikes and reprisals soon, but as said, unless they start mobilizing their army reserves on a wide scale, no major conflagration is on the hoirzon. Calling up some specialized forces to support regular troops already on high alert as the linked article suggests is pretty normal. Netanyahus meeting with Putin in Moscow is still set for tomorrow and he was in Cyprus today, so i really dont think anything is in the works on the Israeli side. As usual, Netanyahu talks a big game but shys away from major moves. Iran might try something of course, but conventional logic would be for them to just go with the Euorpean outrage on Trumps decision and not give him any excuses after the fact. But who knows how much the Mullahs in Tehran control the Revolutionary Guards and their proxies in Syria at this point. Could be entirely up to some regional commander to push the button on the Golan in the coming days. on the other hand there might be something going on in Syria atm ... rumors about a possible airstrike west of Damascus. Also talk about Syrian AD engaging. Edit2 might have been a strike on forces out in the field... maybe the IDF following up on the warnings they issued a couple of hours ago. If thats the case things could actually calm down tonight. We will see. Invasion date? My best bet is Shavuot, 19.-21. of may. Empty streets in Israel and the islamic world is tired after some ramadan days, analogue jom kippur 73. How would Trump react if the new US embassy in Jerusalem would be "Liberty"ed on the 14. of may with his daugther in it? A high ranking Iranian rev. guard has been killed in Israeli strike. Shelters have been activated in Northern Israel. The Iranians have been given the go ahead to strike Israel. 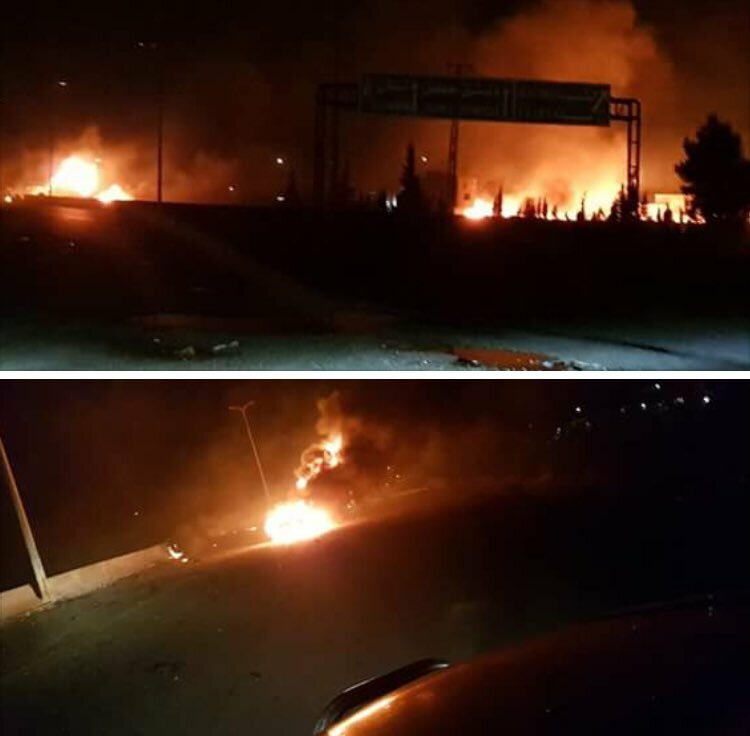 According to yesterday’s reports, Iran’s alleged revenge operation would be guided by General Qasem Soleimani, an officer in the Islamic Revolutionary Guard Corps (IRGC) and commander of its Quds Force, a division primarily responsible for extraterritorial military and clandestine operations. They really seem to hate and fear this guy. Russia has many times the military might of Israel. If the Russia army in Syria get overwhelmed by Israeli army, then Russia can transfer more forces to Syria. Reinforcements to Syria would have to come by sea (takes long too) or by air (always limited in scope), both ways can easily be denied by Israel. It would be a comparativley trivial exercise to shut down Damascus International and Latakia / Tartus. Also, ist not like Russia has transport ships and planes just sitting around and the logistical chain to Support them. The Russian Military is not build for warfare abroad like the US is. Yes sure, Russia could sneak in some fighter jets or light airborne troops on some airfield somewhere out in nowhere if tey really tried, but to what end? The point is, they wouldnt be able to build up any kind of threatening force on Israels doorstep. And Russia has access to Iran air bases such as Hamadan which are not that far from Syria especially with aerial refueling. And Russia ballistic missiles can hit Israel from Russia mainland. And the Russians setting up shop there would just end like their presence at Hmeimim if Israels picks a fight. They'd be wiped out in very short order. Not that some Russian jets in western Iran would matter though, the IAF is perfectly capable of repelling any Russian attack from the East. Which would coincidently force the Russians to fly over at least Iraq, maybe Jordan or even Saudi Arabia as well. You dont think that would get the US involved pretty quickly? As for air refueling - the Russian Air Force has a grand total of 18 tankers. Its severely limited in their capability to Support fighter movements abroad or to conduct long range strikes. As said, the russian Military is not a expeditionary force. They do more than fine on their home turf but are not able to support enough force levels to stand up to a regional power on their turf. As for ballistic missile attacks - yes they can do that. Cruise Missiles from ships and strategic bombers too. But unless they want to nuke a nuclear power, they'll have difficulty getting through Israeli AD/BMD. Israel probably has one of the worlds most advanced air defense networks. Its layered defense umbrella should be perfectly capable of mitigating any concievable Russian ballistic / cruise missile barrage. Sure some would get through, but so what? Russia wouldnt use nukes and they wouldnt go after population centers anyway. And again, you'd think the US would just sit idly by while Russia starts employing that kind of weaponry? If Netanyahu does invade Syria he better be ready for 2 consequences. He wins then he goes down as the best Israeli leader. He loses then he and his part are both finished for good. Saddam easily annexed Kuwait but what happened afterwards with Desert Storm launched from Saudi Arabia was the real deal. Yeah no. Nobody is planning an Invasoin of Syria let alone annexation. Jesus. I think the Anti-America "Tehran Times" publication should join forces with CNN or MSNBC. All 3 have the same mindset.